Tough things sometimes come in small packages. The Tobusch fishhook cactus (Sclerocactus brevihamatus ssp. tobuschii, also known as Ancistrocactus tobuschii) is no exception. Named for its unique hooked spines, this cactus spends the first five years of its life smaller than the size of a quarter before even producing its first flowers. Endemic to eight counties on the Edwards Plateau, where drought conditions are common, this cactus is forced to take things slow. Those first flowers (should an individual manage to grow more than one) are delicate yellow blooms that, if not for their lovely color, would be difficult to spot. They last for about a week during their bloom period (typically February through April); the rest of the year, Tobusch fishhook cacti wait for rain and struggle to survive among threats such as habitat destruction by development and flooding, changes in vegetation and wildfire frequency, illegal collection, a very limited geographic range and restricted gene pool (which result in lack of reproduction), insect parasites and feral hog rooting, drought, and climate change. Tobusch fishhook cactus was classified as an endangered species in 1979, when scientists knew of fewer than 200 plants in the wild. 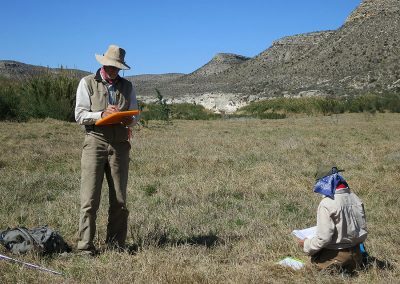 Numbers have since improved through the discovery of additional populations, research on threats, conservation efforts at documented sites, and teamwork between a host of partners including the Wildflower Center, U.S. Fish and Wildlife Service, Texas Parks and Wildlife Department, Texas Department of Transportation, Lower Colorado River Authority, Texas Land Conservancy, The Nature Conservancy and private landowners. Now, approximately 4,500 cacti are known to exist across the taxon’s range. In big news for a little plant, the Tobusch fishhook cactus’s federal conservation status was reclassified from endangered to threatened under the Endangered Species Act as of June 14, 2018. Center staff members are honored to have been part of this positive step toward its recovery. Things began looking up in 2012 and 2013, when the Wildflower Center accepted approximately 300 Tobusch fishhook cacti salvaged from construction sites in Val Verde and Edwards Counties. Center conservationists began studying the growth and reproduction of these plants under greenhouse conditions. Their findings support earlier field research showing that size and longevity matter to the Tobusch’s survival because larger, older cacti produce more flowers than younger plants and flower for longer periods of time. Data compiled by Center conservationists adds to these findings by supporting an additional hypothesis: that flowers of larger plants also produce more stigmas than those of smaller plants. (Hypothetically, more stigmas translates into more capacity for seed-bearing placentas in each ovary.) In other words, larger plants not only produce more fruits, those fruits may also contain more seeds. Thus, the longer a plant lives and the larger it grows, the more reproductive success it will enjoy. It will also make greater contributions to the soil seed bank. We still do not know how long Tobusch fishhook cacti live and reproduce, but research indicates up to 30 years or even more. If longevity is the key to its survival, future research and land management practices designed to protect and sustain naturally occurring populations are critical moving forward. The next step is to further test these hypotheses with pollination and seed-production experiments. The Center’s Tobusch fishhook cactus collection was relocated to Angelo State University in spring 2018 with exactly that in mind. There, the next generation of conservation biologists will study the plants — and hope to further unlock the secrets to its survival — under the leadership of biologist and rare plant specialist Dr. Bonnie B. Amos.